Comfort food doesn’t have to pack on the calories! Is your holiday table overflowing with sides? Not that anyone is complaining, but sometimes it’s hard to fit everything on to one plate! When it comes to a dish to bake and you can’t decide, why not combine them? 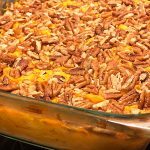 That is exactly how I came up with this sweet potato and squash casserole! 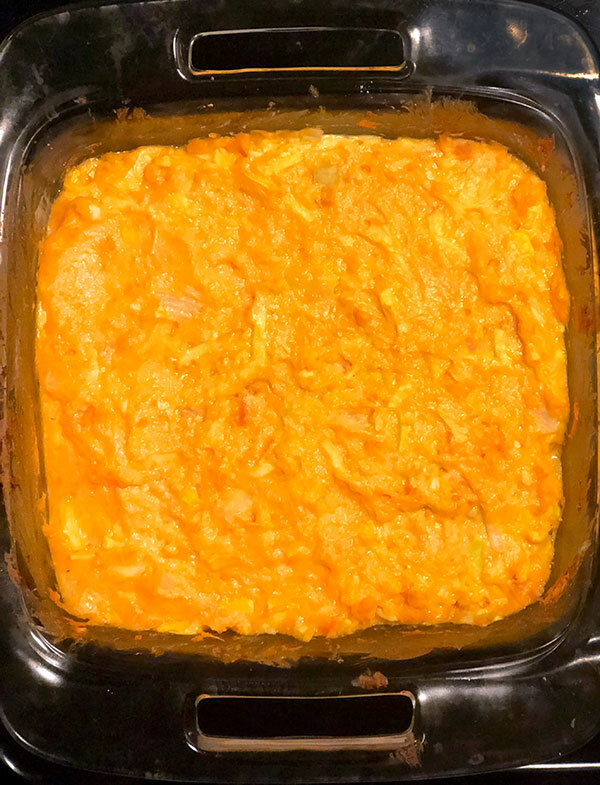 Everyone loves sweet potato casserole around the holidays, but it is usually loaded with brown sugar and topped off with marshmallows. Not needed for this recipe! 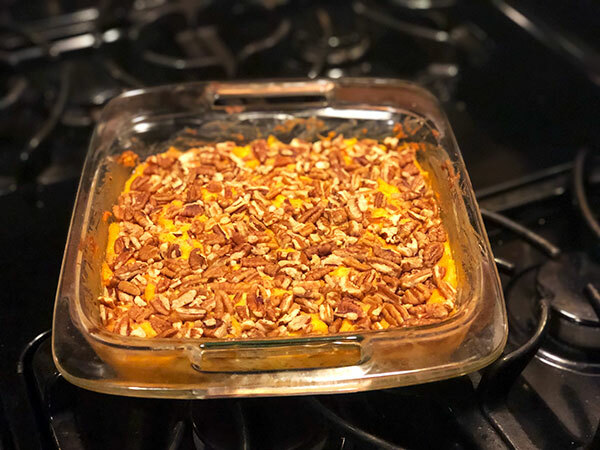 I had a request to make something with squash and while researching came across yellow squash casserole, which is usually a southern tradition with cheese and breadcrumbs. I started thinking about how similar the consistency and taste of squash and sweet potatoes can be so why not put them together? This recipe calls for minimal ingredients and no seasoning required! All you really need is a spiralizer. Set your sweet potatoes in the oven for about an hour first before you prep the rest of the dish. Start by dicing the onions and sauté on a skillet with a little bit of oil. Use a spiralizer on the squash and then chop up in to pieces. Add to the skillet for a few minutes. Once the sweet potatoes are fully cooked remove from oven and scoop out the puree. Toss the skins. Add the sweet potato to a baking dish with some Greek yogurt. Mix in the onions and squash plus some shredded cheese and stir to combine. I chose cheddar but I’m sure I will switch it up each time I make it- I don’t think you can go wrong with whichever kind you choose! Bake at 400F for about 20 minutes. In the last 5 minutes or so throw some pecans on top. Make sure to squish them down so they stick in real good. Once ready remove from oven and serve while hot! A creamy combination casserole of both squash and sweet potato puree with cheese and Greek yogurt. Set your sweet potatoes in the oven for about an hour first before you prep the rest of the dish. Start by dicing the onions and sauté on a skillet with a little bit of oil. Use a spiralizer on the squash and then chop up in to pieces. Add to the skillet for a few minutes. Once the sweet potatoes are fully cooked remove from oven and scoop out the puree. Toss the skins. Add the sweet potato to a baking dish with some plain Greek yogurt. Mix in the onions and squash plus some shredded cheese and stir to combine. Bake at 400F for about 20 minutes. 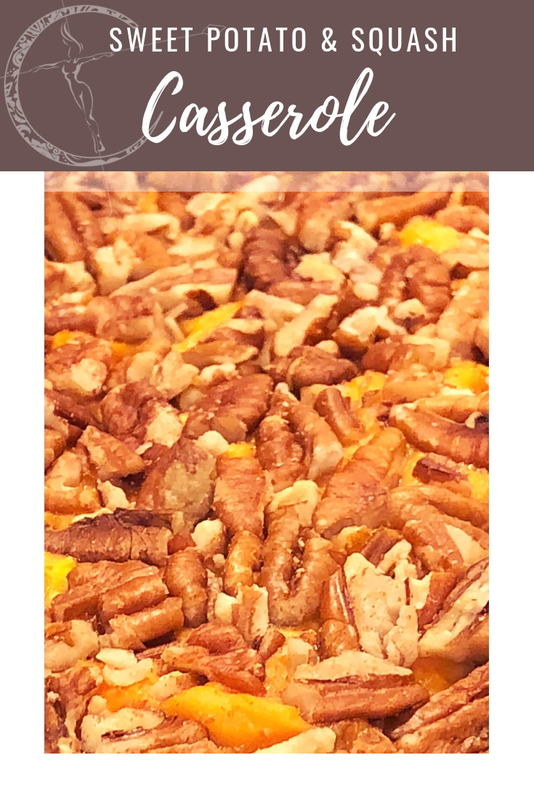 In the last 5 minutes or so throw some pecans on top and squish them down in to the mixture. Once done remove from oven and serve while hot! I suggest cheddar but different kinds of cheese would work just fine! You will also need a spiralizer for this recipe. The majority of the cook time is for the sweet potatoes. 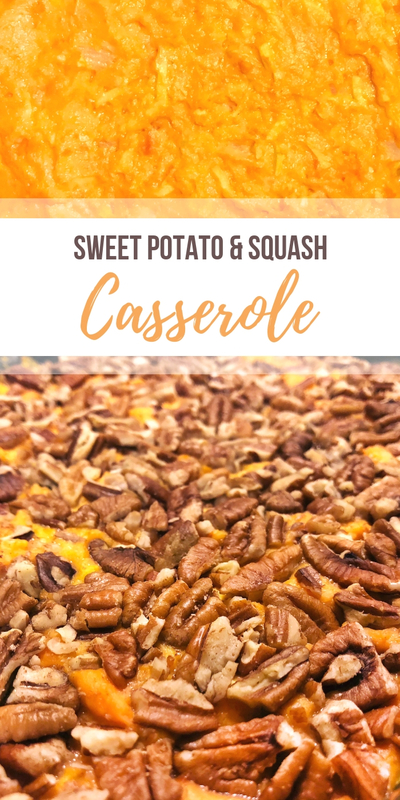 This sweet potato squash casserole is the perfect healthy combination of two comfort foods for your holiday table! 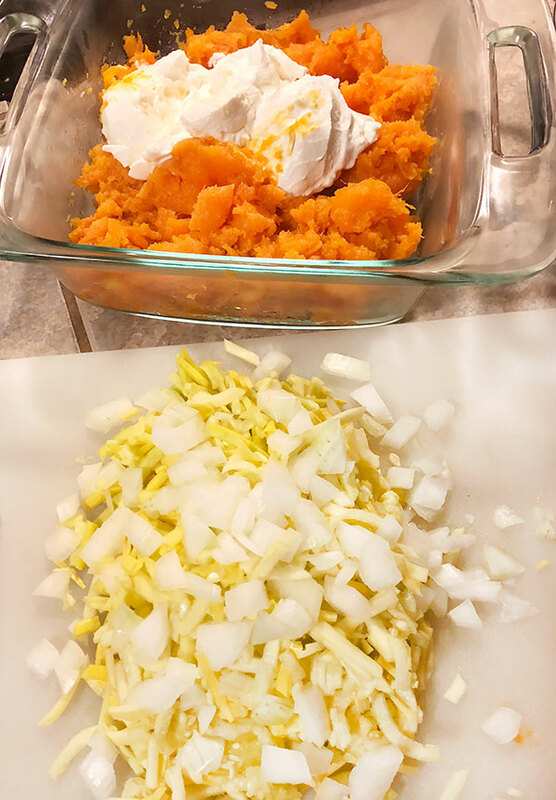 A creamy side dish of both squash and sweet potato puree with cheese and Greek yogurt- load up your plate because there is no guilt here in calorie overload! With just 5 ingredients or less it’s just the kind of recipe you need during the chaos of shopping during the season.